Unlike traditional software where the goal is to meet a functional specification, in ML the goal is to optimize a metric. Quality depends not just on code, but also on data, tuning, regular updates, and retraining. Those involved with ML usually want to experiment with new libraries, algorithms, and data sources—and thus, one must be able to put those new components into production. Figure 1. Image by Matei Zaharia; used with permission. Tracking and managing large numbers of machine learning experiments: MLflow is useful for an individual data scientist tracking his/her own experiments, but it is also designed to be used by companies with large teams of machine learning developers who are using it to track thousands of models. 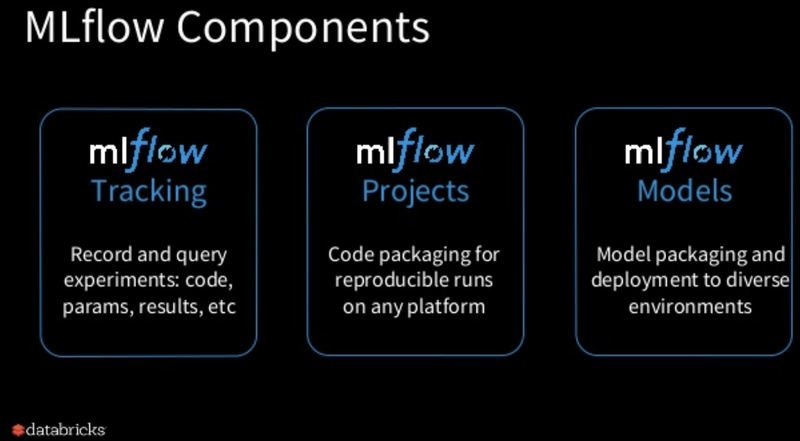 MLflow is being used to manage multi-step machine learning pipelines. Model packaging: companies are using MLflow to incorporate custom logic and dependencies as part of a model’s package abstraction before deploying it to their production environment (example: a recommendation system might be programmed to not display certain images to minors). The upcoming 0.9.0 release has many new features, including support for database stores for the MLflow Tracking Server, which will make it easier for large teams to query and track ongoing and past experiments. We are still in the early days for tools supporting teams developing machine learning models. Besides MLflow, there are startups like Comet.ml and Verta.ai that are building tools to ease similar pain points. As software development begins to resemble ML development over the next few years, we expect to see more investments in tools. Companies need to look seriously at the improved tools for developing machine learning models, many of which are part of more ambitious tools suites. Machine learning can’t be limited to researchers with Ph.D.s; there aren’t enough of them. Machine learning is in the process of democratization; tools that make it possible for software developers to build and train models are essential to this process. We’ve also said the number of machine learning models that are deployed in production will increase dramatically: many applications will be built from many models, and many organizations will want to automate many different aspects of their business. And those models will age and need to be re-trained periodically. We’ve become accustomed to the need for data governance and provenance, understanding and controlling the many databases that are combined in a modern data-driven application. We’re now realizing the same is true for models, too. Companies will need to track the models they’re building and the models they have in production. Traditional software developers have long had tools for managing their projects. These tools serve functions like version control, library management, deployment automation, and more. Machine learning engineers know and use all those tools, but they’re not enough. We’re beginning to see the tool suits that provide the features that machine learning engineers need, including tools for model governance, tracking experiments, and packaging models so that results are repeatable. The next big step in the democratization of machine learning is making it more manageable: not simply hand-crafted artisanal solutions, but solutions that make machine learning manageable and deployable at enterprise scale.